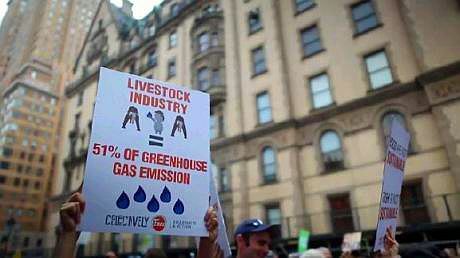 Like me, you might be accustomed to seeing percentage figures on posters and elsewhere, indicating livestock’s share of greenhouse gas emissions. Here’s an image showing a poster from the People’s Climate March in New York in September, 2014. I am yet to see the film, but have reviewed the climate change material from its website. At the time of writing, the site’s “facts” page shows the FAO’s 2006 figure of 18 percent for animal agriculture. A footnote has been added, confirming the FAO’s 2013 estimate of 14.5 percent, as referred to above. The page then states (with my underline), “livestock and their byproducts actually account for . . . at least 51 percent of all worldwide greenhouse gas emissions”. The word “actually” implies an absolute, definitive figure, with none of the qualifying comments of the type I have referred to above. I am uncomfortable with the thought of relying on the figure in that way. The site also indicates that “methane is 25-100 times more destructive than CO2” and “methane has a global warming power 86 times that of CO2”. Both statements appear to be referring to methane’s GWP (global warming potential). Instead, the presentation refers to a GWP of 25 (slide 8), which is the 100-year figure from the IPCC’s 2007 Fourth Assessment Report. In its Fifth Assessment Report from 2013, the IPCC used a figure of 34. Please also see the postscript of 16th November, 2014 below. Postscript 16th November, 2014: I will comment elsewhere on other aspects of Cowspiracy’s “facts” page. However, one I will mention here is the suggestion that cows emit methane through “farting”. The cited article from the International Business Times appears to be incorrect in that regard, as the emissions primarily occur through belching, with a relatively small amount released from “manure management” (being a category specified in the National Greenhouse Accounts). It may seem a trivial issue, but I am concerned that it can appear within a page that people refer to as an authoritative resource. It also reinforces a major misconception about livestock’s emissions that causes many people to laugh them off. LLS is somewhat opaque on this point, but “Tackling Climate Change Through Livestock” clearly indicates that you are incorrect about the reference period year used in LLS, noting: “The 2006 assessment compared its estimate (based on a 2001 to 2004 reference period) with total CH4, N20, and CO2 athropogenic emissions estimated provided by the World Resource Institute (WRI) for the year 2000.” (pg. 15)” This can also be verified from various WRI estimates, if one understands that between LLS and TCCTL, the LUCF estimates were revised downward. The fossil fuel industry in Australia is currently going on an all out expansion. The environmental and water protection controls on the mining of new coal and the expansion of the Coal Seam Gas fracking industry have been demolished. Just one new mine, Whitehaven’s Maules Creek Coal Mine (http://frontlineaction.org/news/) near Boggabri will have the carbon emissions equivalent to the whole of New Zealand, each year, for the next thirty years. The Carmichael mine in Qld will be about 3 times the size. Fracking is spewing out unmonitored methane from wells, rivers, soil and transport. As this is happening our farms are already in an extended Anthropogenic Climate Change induced drought. Cattle and sheep are being slaughtered at unprecedented rates. The other factor in climate change is, of course, human population. We too are on the cusp of drastically diminishing in numbers due to climate related war, displacement, extreme weather events and famine. I have this nasty feeling that the era of our problems of too much obesity, meat production and factory farming could be over sooner than we expect. How long will it take a starving population faced with major crop failures to eat most available livestock? You also have not factored in that the existence of food animals within a traditional farming or hunter gatherer system is established in the natural cycle – sorry, I’m not a scientist so I don’t know the correct terms, but I know that the balance of plant/animal mutually sustains as a way of getting soil nutrients and food recycling. That is not something we want to deny to subsistence farmers or indigenous communities. As far as I’m concerned, the whole global economy and its agricultural practices based on fossil fuel energy and monoculture using artificial fertiliser are totally unsustainable, but there are also the social factors of animal husbandry to consider. Factory farming creates cruelty through unnatural environmental and financial pressures. In a natural system, we work with our animals, we rely on them and love them – even if we eat them we give their species a way of surviving and reproducing. I’m sorry, I know and love a lot of vegans, but I would appreciate it if you stopped confusing the issues of animal welfare with climate change. Fossil fuel is what has upset the health of the biosphere with its unbalanced input and that is the thing we have to shut down; as a concerted effort, together or seperately, but preferably using Non Violent Direct Action. Fight for the disbanding of factory farms and fight for animal rights, but don’t let it divert your energy from the biggest battle we will ever fight; for ourselves and every other large life-form on this planet. Please stop saying that meat consumption is the main cause of climate change, because it is quite obvious that it is not. It saddens me how it clouds the main issue and divides the activist community. Where have I said that meat consumption is the main cause of climate change? My position, stated many times, is that we will not overcome climate change without dealing with fossil fuels and animal agriculture. Indeed, that’s the key message of this post, along with the fact that we shouldn’t get caught up in percentages. Except that Goodland and Anhang are using estimates of total emission from the WR, not the FAO, and these include estimates of methane from all anthropogenic sources. They also parrot back the 37 percent figure provided by the FAO in their original study, without indicating any misgiving (or providing an later details on what those misgivings might be). The purpose of this post was to explain where certain figures have come from. I don’t intend entering into a long debate on the merits of the G&A article. My interest hasn’t been in debating the “merits” of Goodland and Anhang, but rather in figuring out if/why it was discredited. The comment about the methane adjustment was probably gratuitous, since I already noted this on the earlier comment sections. However, I thought it was at least possible that you might be *interested* in the biomass verse production distinction. As should be obvious, I don’t think there is any merit to G&A. But if you have information that suggests my assessments of the various parts of their analysis are incorrect, I’m certainly interested in learning more. Fair enough. Thanks for the information. Thanks Greg. Definitely something to look into further. 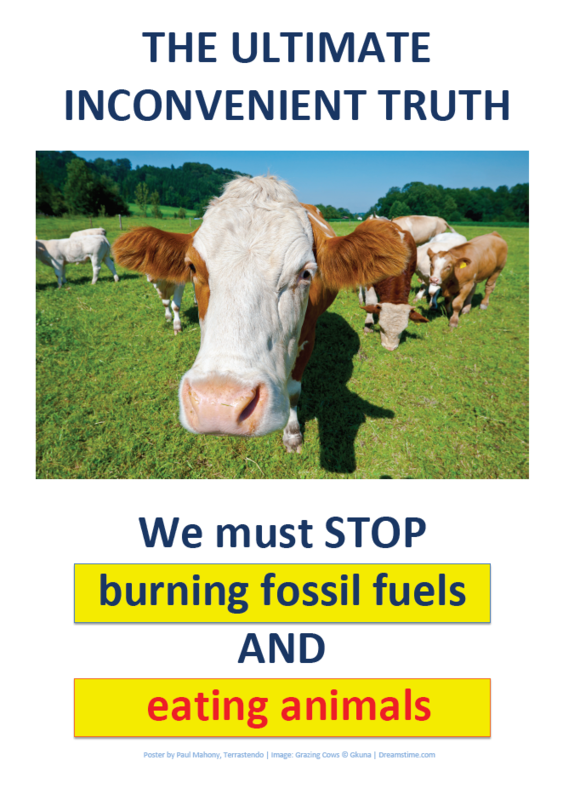 I have referred to methane released from “manure management” previously, including in my “omissions of emissions” article, and have modified the postscript slightly in that regard. My view is that neither the FAO figure nor the Goodland and Anhang figure are particularly useful, since neither provides a proper assessment of mitigation potentials. Have you seen the IPCC’s AR5 report on the mitigation potential of dietary change? They draw on studies that explicitly consider various scenarios, including Stehfest et al. (2009) and Smith et al. (2013). Thanks. I’ve cited Stehfest et al (PBL Netherlands Environmental Assessment Agency) many times but will look into Smith et al. and the specific reference in the AR5 mitigation report. Great work Paul unpacking those arguments and ultimately, producing a virtual protest sign. I think that final message is the clearest and simplest message we can take out to the world. Solving this problem is not easy. Having the movement understand the fundamental solution is critical. Thanks Bruce. Yes, urgent action across all possible fronts is essential.